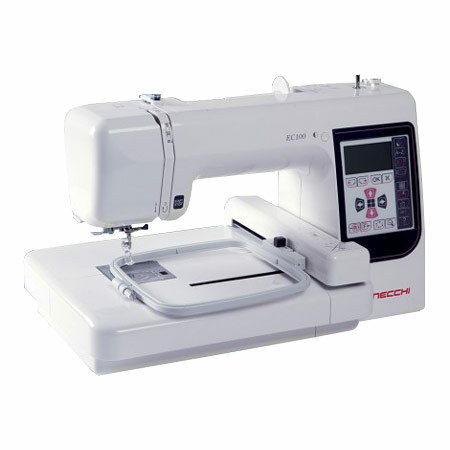 The Necchi EC100 Embroidery machine lets you add Pizzazz to your sewing projects. It is affordable and easy to use. There are 73 built-in designs and 3 alphabet fonts for lettering to start you off. This embroidery-only machine can stitch a design up to 5” x 5” in size at a speed of 650 stitches per minute all while you finish sewing on your regular sewing machine. Expand your horizons by importing new designs with the EC100 in the .JEF embroidery format via the USB port. Need to change the size of the design a little? Basic onscreen editing features include enlarging or reducing, rotating and flipping the design. Choose your design and edit it using the backlit LCD touch screen. The built-in needle threader makes threading the needle a snap. The EC100 embroidery machine makes a great addition to any sewing tool collection. No Longer Available, please call.